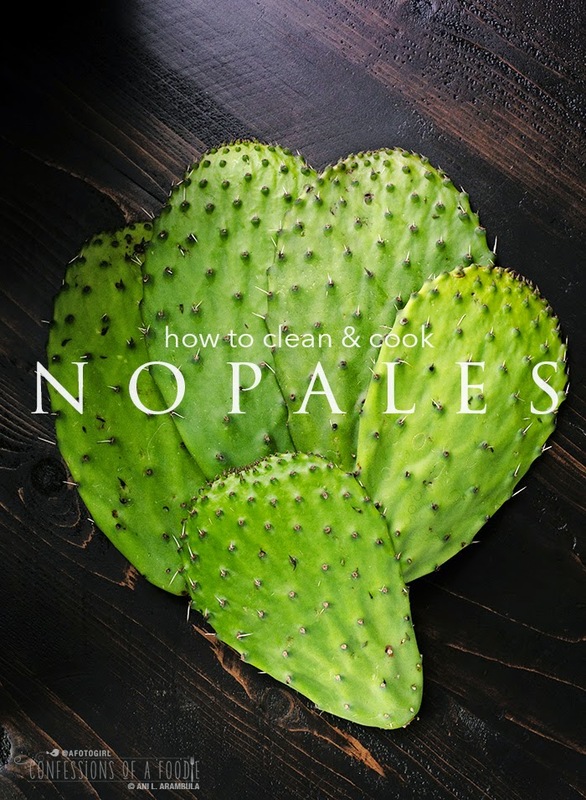 How to clean and cook nopales (cactus) is easy and once you learn the trick, you'll never use jarred cactus again. Cactus might look intimidating but once you learn how to clean and cook nopales, you'll never go back to buying the jarred kind. 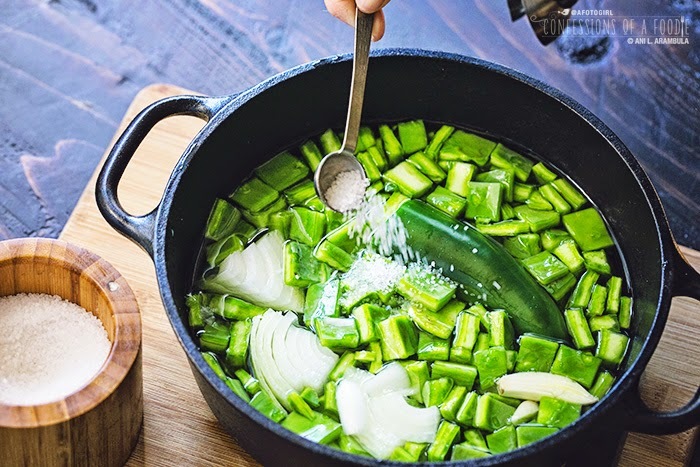 Nopales, or cactus in English, is a household staple in many Mexican homes. 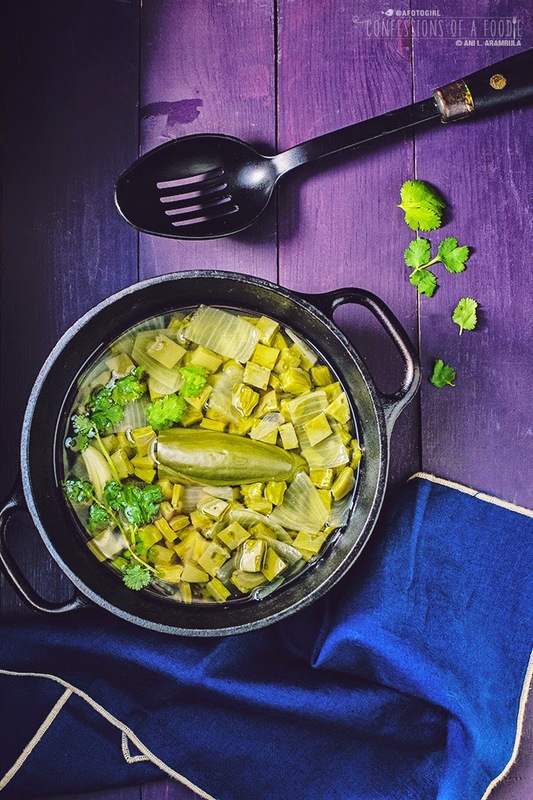 It's a low carb, fat free, cholesterol free food that is high in potassium, magnesium, calcium and vitamins A and C. A one cup serving of cooked cactus is only 23 calories and 3 of it's 5 carbohydrates are dietary fiber, giving it a glycemic load of just 2. This makes it a great choice for low carb lifestyles and a definite diabetic-friendly food. We had it often in our home. My parents would scramble it with eggs, onions and lots of cilantro for breakfast. 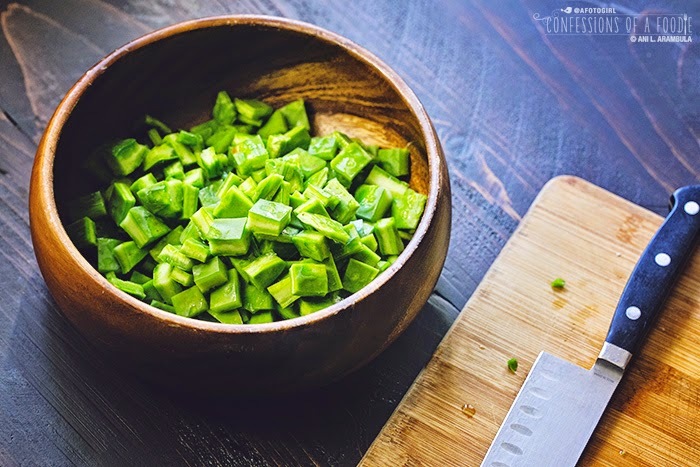 And on warmer days, they'd make an enselada de nopales con frijoles de la olla (nopales salad with fresh cooked beans). I'll show you that recipe next week. 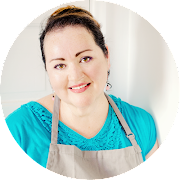 Today, I'm showing you how to buy, clean and cook them. They can then be eaten as is for a side dish or added to various recipes. Walk around almost any neighborhood in San Diego county, and you're bound to find cactus growing in several yards. My grandmother used to grow it in her yard. When the mood hit her to make nopales, all she had to do was take her big knife out to her yard and slice off some cactus paddles. I think it eventually got a bit unruly and she got rid of it. Now when she wants some, she'll walk across the street where a neighbor has it growing in his front yard and has given her the OK to help herself. 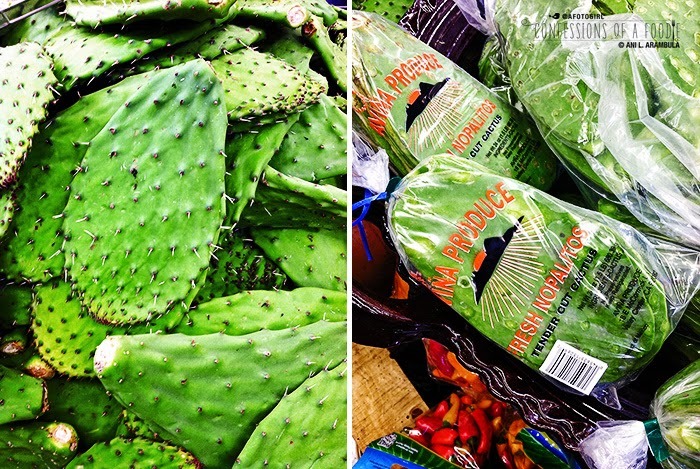 Many major supermarkets sell jars of cooked nopales in the Mexican foods aisle. Cactus from those jars tend to be slimy (easily rinsed off but can be off-putting if you're not expecting it) and sometimes, a little overcooked for my taste. I prefer my cactus to have a bit of a bite to it, al dente, if you will. Some major supermarkets (locally, Ralph's, Vons and Albertsons), sell bags of raw, already cleaned and diced nopales. My problem with buying them in bags is you don't know the size of the cactus paddles before they were cleaned and prepped. I prefer to be able to buy them where I can pick and choose the cactus. The smaller the leaves, the younger and more tender they are. As they grow, they get a bit more fibrous which can make them a bit tough. So I get the smallest ones I can find. I prefer to buy them at Northgate Market (there are several around the county) where the turnover is fast and they have a good selection of small, young leaves that I can pick and choose from. This is an inexpensive, budget-friendly food. You can buy 2 pounds for $0.99. And if you don't want to clean them yourself (don't be scared, I have a video below that shows you how easy it is! ), they sell bagged and cleaned relatively young nopales for not much more. Once you have removed the needles (I call them "thorns" in the video because if you're not paying attention when you handle them, they can prick! ), give them a quick rinse under cool running water than cut them up. I was using these for salad so I opted to dice them but you can also slice them into 1-inch by ¼-inch long strips (like they are in the jarred variety). First slice them lengthwise in ½-inch thick strips. You can see in this photo how small these cactus paddles are. Tender! Turn them and slice them again to make ½-inch diced pieces. You're going to want to give these guys a rinse. 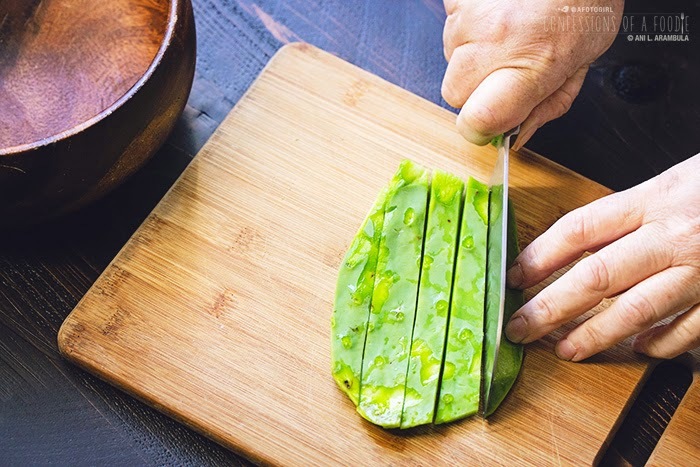 Have you ever cut aloe vera? Know the sticky, thick substance that oozes out that you use for burns? It's nectar and it can get a bit sticky and slimy so to minimize, I like to rinse these guys before I cook them. Into a pot they go. Add enough water to cover (they'll float) and toss in a big jalepeño, a bit of onion and garlic and some salt and you're set. Fifteen minutes later and you've got tender, al dente nopales. Just drain them and give them a quick rinse and they're ready to eat as is, throw into a salad, scramble with eggs, or add to a taco. Truly delicious and nutritious. Give 'em a whirl and let me know what you think. Using a spoon at a 90 degree angle, scrape off the cactus needles on both sides of each paddle (see video above). Slice the bottom of the cactus paddle off and discard. Run a paring knife around the edge of the cactus paddle about ¼-inch in from the edge to remove the needles growing on the edge. Repeat with remaining paddles. Once all needles are removed and paddles have been trimmed, rinse well under cool running water. Dice cactus into a ½-inch dice and place into a colander. Rinse again before transferring to a 3 quart dutch oven or heavy bottomed pot; set aside. Cut the top off of a jalapeño to expose the interior. Add to the pot of cactus along with the onion, garlic and salt. Place pot on medium heat, cover and cook for 10 minutes. At the 10 minute mark, remove lid and add the cilantro. Cook for 5 minutes longer. 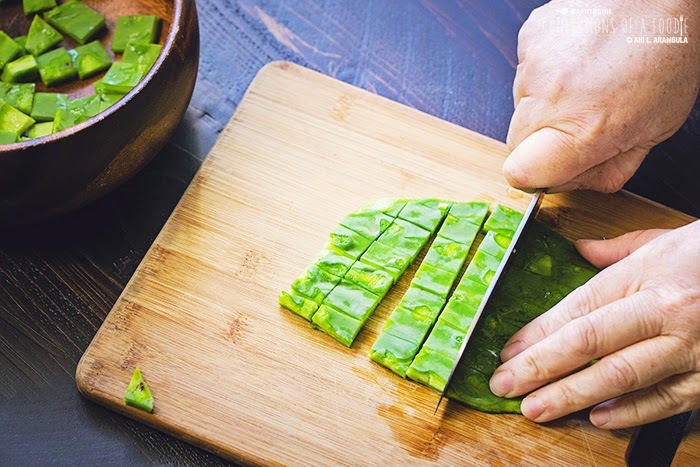 The nopales are ready when they give a little when you squeeze a piece gently between your thumb and index finger. You want them tender but not mushy. Remove from heat and drain into a colander. Rinse quickly with water and eat as is or use in your favorite recipe. Hey! 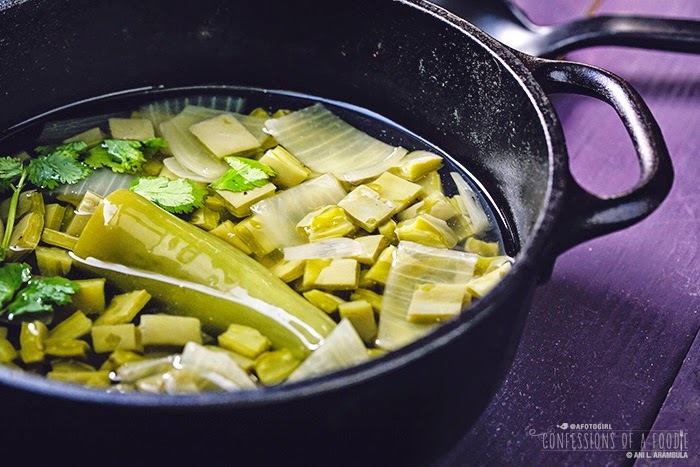 I stumbled upon this post via googling 'nopales' looking for pix of nopales in food and thought your pic was beautiful!